The wood-framed tents on this muddy field in the Bekaa Valley have burned to the ground, leaving only remnants of the lives of the Syrian refugees and migrant workers who occupied them: Shoes. Scattered tomatoes. A pink plastic comb. Metal latrines , provided by the U.N. High Commissioner on Refugees. The tents were torched by local villagers, amid allegations that some residents of the camp had sexually molested a mentally disabled young man. The ousted Syrians say that claim was fabricated at the behest of a new landowner who wanted to evict them from the site. At least 400 refugees and migrant workers lived in this informal encampment on the outskirts of Qsar Naba, a mostly Shiite village of 8,000 people. They are typical of many of the estimated 800,000 Syrians who have fled to Lebanon since the beginning of Syria’s civil conflict in 2011. Because of political and sectarian sensitivities, Lebanon did not establish its first official refu­gee transit camp until last month. That camp has 70 tents. The vast majority of those fleeing the violence have found themselves dependent on private landowners for shelter. 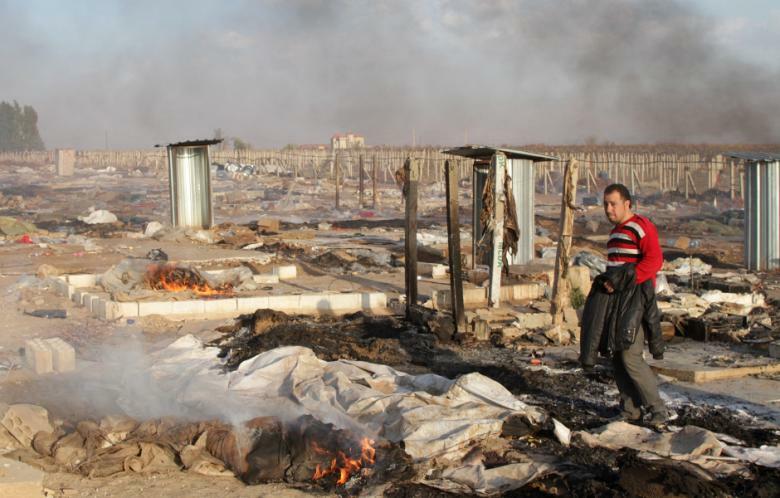 The camp that was burned had been used by Syrian migrant workers for 15 years. Since the start of the civil war, however, workers have stayed all year, instead of leaving when seasonal agricultural work dried up. Friends and family joined them. The UNHCR says the camp had 400 residents in 40 tents, although the residents and the local mayor put the number closer to 1,000. The government of Lebanon, a country the size of Delaware, struggles to provide its 4 million citizens with basic services such as water and electricity. It has been further overwhelmed by the flow of people fleeing the war. The influx has strained resources, increased competition for jobs and stirred sectarian tensions, as the Syrians — mostly Sunni Muslims — seek refuge in this largely Shiite area. Daher, aided by a friend, Abbas Harbe, ticked off a list of complaints about the Syrians that conformed to local stereotypes. The refugees look at women inappropriately, Daher said. They have poor hygiene, Harbe said, and they steal. Sunni preachers come to visit them. “We see them sitting with a sheikh, with a big beard, and it’s scary for us,” Harbe said. The tensions appeared to have bubbled over last weekend, when the family that recently bought the land housing the camp accused the Syrian residents of molesting the disabled man. The landlords gave the entire group 24 hours to leave. But villagers returned before the deadline, residents said, and threw molotov cocktails from the roof of a nearby, half-constructed building. The tents, made of tarpaulins attached to wood frames, quickly ignited. “We said, if you find someone who is molesting the boy, you are welcome to hang him from the power cable,” said Abu Abdullah, a father of five who said he was too scared for his safety to give his real name. The Syrian Opposition Coalition, the main group representing those trying to oust Syrian President Bashar al-Assad, condemned the forced eviction of the camp as “unethical and inhumane” and called the molestation allegations “completely false.” A local doctor, too, concluded there was no evidence of an assault. Ahmed said residents of his camp had taken in their displaced countrymen for one night but then asked them to leave after being threatened by local villagers. Lisa Abou Khaled, a UNHCR representative for the Bekaa region, said accommodations for refugees are increasingly hard to come by, with the few landlords who have vacant buildings or land often unwilling to rent. She said that many Lebanese have opened their homes and property to those fleeing Syria, and added that forced evictions like what happened in Qsar Naba were unusual. I have a bad feeling the Syrian refugees are going to end up like the Palestinians in Lebanon. Bad feeling? Tell Israel-Saudi alliance to stop arming al Qaeda al Khara.. They don’t have arms in Lebanon yet. But Ill be sure and tell them when HA is unarmed. You’re disgusting, I said Al Qaeda..in Syria not in Lebanon. for non-Jews Russians but didn’t let Palestinian refugees back..
millions Palestinian..because of Israel-Saudi alliance Midlle-East Master-Piece. while German Jews wanted to work against anti-Semitism.. But Hind … when they were offered citizenship as Lebanese (seems that was a one-time opening on the stock-market of life) they turned it down … bad plan. Really, EVERYONE should be a citizen of the country of birth. Some of that ‘Dual-Citizen’ crapola. We are talking legal terms.. “Holocaust surviver” is not a term used in international law. “Refugee” however is a legal term which means a displaced person as a result of conflict, not the grandchildren of people who fled a war. Okey you do what you want..ME tradition is; not renounce your land. the rebels in Syria will join the army to oust Al Nusra.. it don’t fit Israels plans. To be honest, I dont know what Israel wants in Syria. History will decide on that. And no, 7 million people (dont even know what the number is) dont want or need other parts of the Middle East, not even Gaza. Only Judea and Samaria should be annexed as there is already 600,000 Israelis living there. I said Al Qaeda..they aere no in Lebanon they are in Syria. Maybe the Syrian refugees and the Lebanese Shi’ites should trade places! Well, easy to see why the UN is a little hesitant to be helping Lebanon …. the money just goes up in smoke – unless you pay off the local politicians. It would be just payback if these refugees were armed and attacked their Hezbollah tormentors in Lebanon who made them flee from Syria in the first place. Hezbollah is to blame for this situation.